435 Beacon is located on the SW corner of Beacon and Hereford, with 12 Hereford (433 Beacon) to the east, across Hereford, 441 Beacon to the west. 448 Beacon to the north, across Beacon, and 7 Hereford to the south. 435 Beacon (5 Hereford) was designed by Alfred S. Bither, architect, and built in 1879-1880 by Edward E. Chapin, mason, for real estate dealer Henry Whitwell on land owned by his brother and partner, Samuel Horatio Whitwell, one of four contiguous houses (435 Beacon and 7-9-11 Hereford) built for speculative sale. Henry Whitwell is shown as the owner on the original building permit applications for 435 Beacon and 7-9-11 Hereford (one application for three houses), both dated December 13, 1879. In his Houses of Boston’s Back Bay, Bainbridge Bunting attributes 435 Beacon, 7-9-11 Hereford, 364 Marlborough, 27-29-31 Hereford, and 216-218 Commonwealth – all built in 1879 – to R. S. Bither. This is a misreading of the handwriting on the permit applications. It is clearly written as “A. S. Bither” on several of the permit applications, and is less legible on several others. There was no R. S. Bither listed in the Boston City Directories at any time in the 1870s or 1880s, whereas Alfred S. Bither was a practicing architect there from 1870 to 1880. Samuel H, Whitwell purchased the land for 435 Beacon and 7-9-11 Hereford on November 29, 1879, from Edwin Markland White. He had purchased the land on October 24, 1879, from the estate of Daniel Davies, a housewright and master carpenter who had died in June of 1878. He and his wife, Amity Bacon (Hastings) Davies, had lived at 449 Beacon. The land was part of a larger parcel Daniel Davies had purchased on June 20, 1866, from the Boston Water Power Company (Daniel and Amity Davies’s daughter, Susan, was the wife of Grenville Temple Winthrop Braman, treasurer of the Boston Water Power Company). Click here for an index to the deeds for 435 Beacon, and click here for further information on the land on the south side of Beacon between Hereford and Massachusetts Avenue. On September 25, 1880, 435 Beacon was purchased from Samuel Whitwell by Mary (Andrews) Talbot, the wife of William Henry Talbot. He was a wool merchant. They previously had lived at 2 Guild. They lived at 435 Beacon during the 1880-1881 winter season, but moved thereafter to the Hotel Bellevue at 17 Beacon. On October 24, 1881, 435 Beacon was acquired from Mary Talbot by John Brooks Young, a manufacturer of tanners’ materials and dyestuffs. He and his wife, Elizabeth Woodham (Norton) Young, made it their home. They had lived in Newton in 1880 and at the Hoffman House hotel (corner of Berkeley and Columbus) in 1881. On July 25, 1883, he transferred the property into his wife’s name. They continued to live there during the 1888-1889 season, but moved thereafter. By the 1889-1890 winter season, 435 Beacon was the home of banker and stockbroker James F. A. Clark and his wife, Estelle P. (Stuart) Clark. They previously had lived at the Hotel Vendome. They continued to live at 435 Beacon during the 1891-1892 season, but moved thereafter to 33 Bay State Road. On November 12, 1892, 435 Beacon was acquired from Elizabeth Young by cotton broker and banker Cyrus Gilbert Beebe and his wife Janet (Jannet/Jessie) Ingliss (Hogg) Beebe. They had married in June of 1892 and previously had lived in Wakefield, where they continued to maintain a home. Cyrus and Janet Beebe continued to live at 435 Beacon during the 1898-1899 winter season, but moved thereafter Framingham, where he died in January of 1901, leaving 435 Beacon to his wife. She remarried in October of 1902 to Edward Chester Center. After their marriage, they lived in New York City and France. She continued to own 435 Beacon and lease it to others. During the 1899-1900 winter season, 435 Beacon was the home of banker William Pratt Lyman and his wife, Helen (Beeckman) Pratt. They had lived at 254 Marlborough during the previous season. They also maintained a home in Nahant. By the 1901-1902 season, they were living at 353 Commonwealth. During the 1900-1901 winter season, 435 Beacon was the home of boot and shoe dealer Arthur E. Mann and his wife, Eleanor M. (Fairbrother) Mann. They had lived at 308 Beacon earlier in 1900. They had moved by the next season and by the fall of 1903 were living at the Hotel Bellevue at 21-23 Beacon where, on November 5, 1903, Eleanor Mann’s diamond jewelry was stolen. By the 1901-1902 winter season, 435 Beacon was the home of Richard Spofford Russell and his wife, Mary Gertrude (Sutton) Russell. 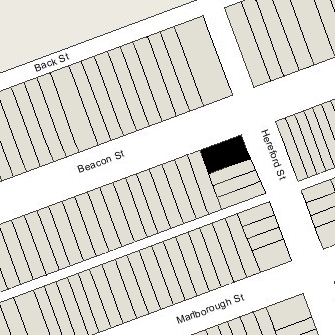 They had married in October of 1901, and 435 Beacon probably was their first Boston home together. Soon after their marriage, they also built a home, Oakland, in North Andover. Richard Russell was associated with his brother, William Augustus Russell, Jr., in the management of the Russell family’s manufacturing and mining interests. Richard and Mary Russell continued to live at 435 Beacon during the 1902-1903 winter season. 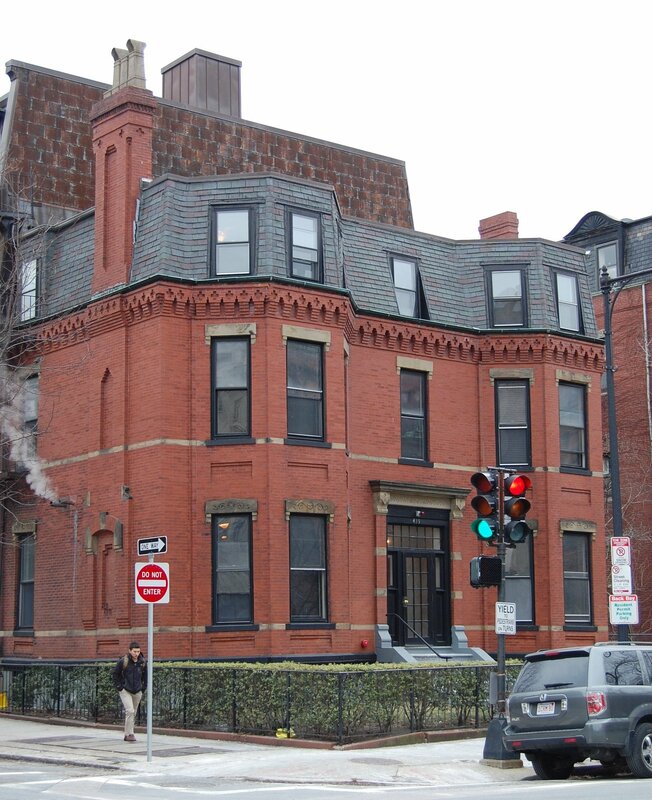 Later in 1903, they made their Boston home at 135 Commonwealth with his mother, Frances Spofford (Hall) Russell, the widow of William Augustus Russell, Sr.
By the 1903-1904 winter season, 435 Beacon was the home of Abbie Bartlett (Adams) Worthington, the widow of Roland Worthington, publisher of The Daily Evening Traveller newspaper. In 1902, she had lived at 471 Beacon. She continued to live at 435 Beacon until her death in August of 1906. During the 1906-1907 winter season, 435 Beacon was the home of Dr. Francis Charles Murphy, a physician, and his wife, Anne M. (Scott) Murphy. They previously had lived at 1609 Tremont in Roxbury, where he continued to maintain his office. They had moved to 315 Marlborough by the next season. By the 1907-1908 winter season, 435 Beacon was the home of Dr. Edward Clark Streeter and his wife, Alice Martha (Chase) Streeter. They previously had lived in France, where their daughter, Helen Chase Streeter, was born in March of 1907 in Paris. Edward Streeter was physician doing bacteriological research at Massachusetts General Hospital. He later became an expert on medical humanists and artist/anatomists of the Renaissance, and in the 1930s taught courses in the history of medicine at Yale Medical School. By the 1909-1910 winter season, the Streeters had moved to 413 Beacon. On September 2, 1909, 435 Beacon was acquired from Janet (Hogg) Beebe Center by real estate dealer James Sumner Draper. He continued to own the house for the next five years. 435 Beacon was not listed in the 1910-1915 Blue Books, nor was it enumerated in the 1910 US Census. On October 1, 1914, 435 Beacon was purchased from J. Sumner Draper by William Lincoln Crosby. The property was conveyed by Lillior (Lillie) Taylor (Dowling) Nutting, the widow of William B. Nutting and the sister of J. Sumner Draper’s partner, Mark Temple Dowling. William Crosby was general manager of Lewandos dry cleaners. He previously had lived at 286 Boylston, the same address as Lewandos. He also maintained a home in Harvard. He continued to live at 435 Beacon during the 1919-1920 season, but moved thereafter back to 286 Boylston. By the 1920-1921 winter season, 435 Beacon was the home of leather manufacturer Arthur J. Mulholland and his wife, Eliza B. (Clark) Mulholland. In January of 1920, at the time of the 1920 US Census, they had lived in Ipswich. They continued to live at 435 Beacon during the 1922-1923 season, but moved thereafter. On September 7, 1923, 435 Beacon was acquired from William Crosby by real estate dealer Robert Moore Dobbins. He was a widower and lived at 435 Beacon with his brother, Henry Dobbins, Jr., a salesman in Robert Dobbins’s real estate office, and their widowed father, Henry Dobbins, Sr., an optician. They previously had lived at 338 Commonwealth. Robert Dobbins married again in July of 1926 to Agnes Webster and they lived at 435 Beacon after their marriage. Henry Dobbins, Jr., moved in about 1928 to an apartment at 373 Commonwealth and by 1930 was living in New York City. Henry Dobbins, Sr., moved in about 1929 to the Mayflower Hotel at 1138 Boylston and died in January of 1930. Robert and Agnes Dobbins continued to live at 435 Beacon during the 1928-1929 winter season, but had moved by 1930 to 467 Commonwealth. On April 30, 1929, A. F. Baker & Co., Inc., bankers (Arthur F. Baker, president and treasurer) foreclosed on a mortgage it held on 435 Beacon and took possession of the property. 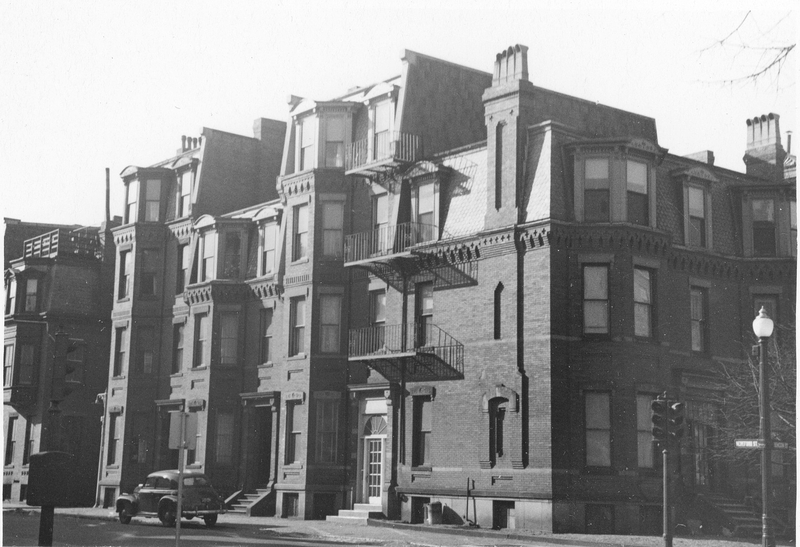 In January of 1930, the Beacon Street Building Corporation filed for (and subsequently received) permission to replace 435 Beacon with a seventeen-unit apartment building to be designed by architect Charles R. Greco. The application was abandoned. On May 8, 1931, 435 Beacon was acquired from A. F. Baker & Co. by Miss Gertrude Louise Victory. She lived in Cambridge and later in Abington. She was a stenographer in a law office and probably held the property on behalf of a client of her employers. 435 Beacon was not enumerated in the 1930 US Census. It was not listed in the 1930-1937 Blue Books nor in the 1930-1937 Lists of Residents, and was shown as vacant in the 1930-1941 City Directories. On May 3, 1937, 435 Beacon was acquired from Gertrude Victory by Charles Sioris. In December of 1937, he applied for (and subsequently received) permission to convert the property from a single-family dwelling into three apartments. He subsequently abandoned the application. On January 5, 1938, Katharyn W. Crawford foreclosed on a mortgage she held on 435 Beacon and took possession of the property. On October 11, 1938, 435 Beacon was acquired from Katharyn Crawford by Cora B. (Reinherz) Watson, the wife of architect George Wesley Watson. They lived at 447 Beacon. In May of 1938, she applied for (and subsequently received) permission to convert 435 Beacon from a single-family dwelling into three apartments. On November 17, 1939, 435 Beacon was acquired from Cora Watson by Huntington Shops, Inc. (Harold L. Clark, president), and on April 6, 1940, it was acquired from Huntington Shops, Inc., by real estate dealer Edward J. Ball. On August 18, 1941, 435 Beacon was acquired from Edward Ball by Paul A. Cassell. In September of 1941, he applied for (and subsequently received) permission to build an additional apartment in the basement. The property changed hands and on December 9, 1954, was acquired by Louise E. McKenzie. In November of 1954, prior to taking title to the property, she applied for (and subsequently received) permission to legalize the occupancy as five apartments. Not soon thereafter, the building suffered fire damage and in August of 1955, Louise McKenzie filed for (and subsequently received) permission to repair the damage and establish the occupancy as five apartments. On February 23, 1956, 435 Beacon was acquired from Louise McKenzie by Anthony F. Caccamo. That same month, Roy E. Ciochetti (presumably acting for Anthony Caccamo) filed for (and subsequently received) permission to repair the fire damage and convert the property from four apartments to seven apartments, including rebuilding the third floor. On April 9, 1964, 435 Beacon was acquired from Anthony Caccamo by Nancy A. Carter. On June 23, 1978, 435 Beacon was acquired from Nancy Carter by Marilyn Ruth (Hanley) Tobey. In June of 1979, she applied for (and subsequently received) permission to reduce the number of apartments from seven to six. On February 22, 1995, she transferred the property to herself, as Marilyn Ruth Hanley, trustee of the M. R. H. Realty Trust. By that time, she was a resident of Scottsdale, Arizona. Marilyn Hanley died in May of 1995. On September 26, 1995, her sister, Mianne M. Hanley, as successor trustee of the M. R. H. Trust, transferred 435 Beacon to herself. On September 28, 1996, Mianne Hanley, a resident of Cambridge, transferred the house to the MMH Real Estate Company, LLC, of which she was the manager of record. On July 24, 2008, 435 Beacon was purchased from the MMH Real Estate Company by the 435 Beacon Street LLC (Frank Pasciuto and Fermina Pasciuto, managers of record). 435 Beacon remained an apartment house, assessed as a four- to six-family dwelling, in 2017.